Grab some friends, a stack of cards and get ready for a party! Each player draws 3 theme cards (Ex: things to take tp a desert island, cult movies, games played in a schoolyard). 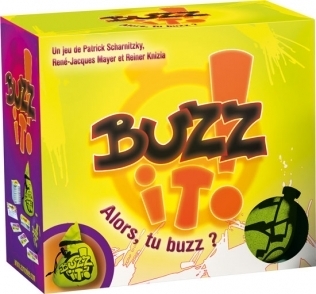 One player take the buzzer, read a theme, then hit the button on the buzzer. each player has 5 seconds to say a word, name, or phrase related to the theme. If you're too slow, you get stuck with the card. The game ends when all cards are gone. The player with the most cards is the loser, and is mocked mercilessly by their peers. Discover hundreds of themes for the whole family, or play with the more grown-up themes...there are laughs enough for everybody!